The Optimum Cold Laser Therapy System is a member's only library and dosage tool. 2. Learn more using our free Training Library. If you have ever tried to search for published information about cold laser therapies, you know it is a shot-in-the-dark. Our new research tool solves this problem. Just enter a keyword or partial keyword to see the best of 5000 published resources (including research papers, articles, books and videos) showing the efficacy of cold lasers. We then use this published info and our protocol engine to dynamically adapt the protocols to each specific patient and laser system. Set up an account and select your laser system, patient type (humans, horses, dog or cat) and what action the system should take at the end of each step in the treatment. Enter the patient size and pigment (skin color or fur color). Enter your desired treatment goal (like maximum pain relief) and select a health condition that you want to treat. Review the overall treatment plan and SOAP information. See the calculated Optimum dosage for each point in the treatment process. 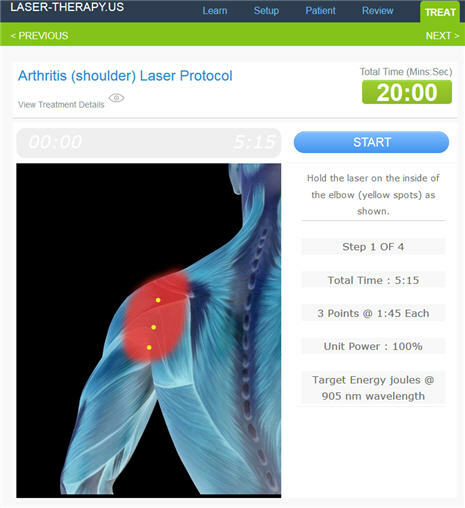 While looking at a full-color image of each treatment area, the timer will tell you exactly when you have reached the optimum energy dosage. It's Easy to Get the Optimum Dosage for any System, Any Patient, Any Condition, Every Time. In October of 1998, Jan Turner and Lars Hode published an article in the Journal of Clinical Laser Medicine & Surgery called "It's All in the Parameters: A Critical Analysis of Some Well-Known Negative Studies on Low-Level Laser Therapy", they did an exaustive study of clinical research and found that the studies with negative results were usually based on inappropriate dosages. Right now the market is flooded with options ranging from 1 mW to 60,000mW in power level so it is easy to see how many research studies and treatments can be based on dosages that are too high or too low. The Laser-Therapy Optimum System is the ultimate tool for getting the best results from your cold laser equipment because our adaptive system calculates the Optimum energy for hundreds of unique therapies. Every cold laser manufacturer talks about how their system can deliver the Optimum energy that produces the best patient efficacy but they only publish a handful of protocols or general laser therapy protocols that don't adjust for all the real world variations. That is where the Laser-Therapy Optimum systems is a big breakthrough. Using 7 different variables (laser output, pulse rates, power level, patient type, skin pigment, patient size, treatment goals and condition), the Optimum System calculates and controls the treatment plan. Users can search the database for a specific symptoms or body parts and be shown a step-by-step process including treatment points, target energy levels, and treatment times . Using the treatment timer, users just setup the laser and then press start. The system will count down the treatment time as it reaches the Optimum. Once the system reaches the Optimum for a treatment point, the system will notify the operator and automatically move on to the next treatment point. The results are unprecedented accuracy and consistently great results. To get access to our powerful and flexible cold laser protocol tool, create a new membership or request a demo account. Laser-Threapy.US is a resource to help educate people about the underlying science of photobiomodulation. The Research tool and the training tool (links at the top of the page) are available to everyone. The protocols based on these resources are for members only. To browse and compare cold lasers, we recommend shopping at ColdLasers.Com and researching low level lasers at ColdLasers.Org. In using this site, you must agree to our terms and service agreement. 2019 Laser-Therapy.US All rights reserved. By using this site, you are accepting the terms of service.